Perfect in every way! Such a beautiful resort and super nice staff.. we loved it and can’t wait to go back! HMF a must for dinner!! Love the location however there was a musty smell when I opened my room door. Wonderful boutique hotel! Stayed there for one night and the pool was awesome. Having lived under Palm Beach’s glitzier shadow for some years, West Palm Beach has emerged to claim its place as a premier holiday resort. Boasting one of the most beautiful coastal panoramas in the States, West Palm Beach is ideal for both families and couples. Hotels in West Palm Beach come in all shapes and sizes, with something to suit all tastes and budgets. West Palm Beach has no less than eight beaches to its name, each one a paradise for sun-worshippers. If you’re wondering where to stay in West Palm Beach, you’ll find plenty of options available. For something secluded and relaxed, Gulfstream Beach is the place to visit. It is so-called because of the Atlantic current that flows lazily past, making it an excellent spot for scuba-diving and snorkeling. The beach is well equipped for visitors, with picnic tables and barbeque pits free for anyone to use. With a handy playground and beach chair rental available, Oceanfront Park is popular with families staying at hotels in West Palm Beach. There are some superb places to eat within easy reach and there are free use of beach wheelchairs for those with mobility issues. While you might expect to see A-listers and the wealthy gracing the streets of Palm Beach, the actual beach attracts a real mix of visitors. With year-round sunshine and one of the most stunning coastlines in Florida, it’s easy to see why Palm Beach is a major attraction. You’ll find the aptly-named Peanut Island between Palm Beach and Singer Island. While it offers excellent conditions for water sports and snorkeling, this tiny isle offers a fascinating day out for history-buffs staying at West Palm Beach hotels. Peanut Island is the site of John F Kennedy’s personal nuclear bunker, built during his time in office. If you’re wondering where to stay in West Palm Beach with your dog, be sure to book a hotel close to Juno Beach. Dog-friendly and with plenty of space, it’s ideal for families who can’t bear to leave their pooch behind. If you’re staying in West Palm Beach hotels with the family, head to Lake Worth Beach. With a gently-shelving shoreline, regular lifeguard patrols and an expansive playground just a few steps from the sand, it’s ideal for those taking a vacation with younger children. Carlin Park Beach offers a little bit of everything. For families, there’s a well-facilitated playground and a series of pavilions that can be rented for picnics in the shade. For those who want to keep their fitness levels topped up, there are walking trails dotted with strategically-placed exercise stations. Carlin Park is also home to the Seabreeze Amphitheater, which hosts regular concerts and performances throughout the year. One of the most popular beaches in the area is Delray Beach. With bike trails, shaded areas, excellent snorkeling conditions, and even a track for remote-controlled cars, it’s an easy way to spend a day and close to plenty of West Palm Beach hotels, too. John D MacArthur Beach is perfect for couples who want to spend some quality downtime together, away from the crowds. With a park nearby, you can choose to go wildlife spotting or take a quiet stroll along the shore as the sun slips over the horizon. A trip to the Everglades National Park is an astonishing experience. Millennia-old, the Everglades is a vast swathe of saltwater marshes, dark mangroves and sawgrass prairies. Take an airboat trip to the Park and see if you can spot alligators basking in the sun. The string of islands that sit just off the coast from West Palm Beach make up the Florida Keys. 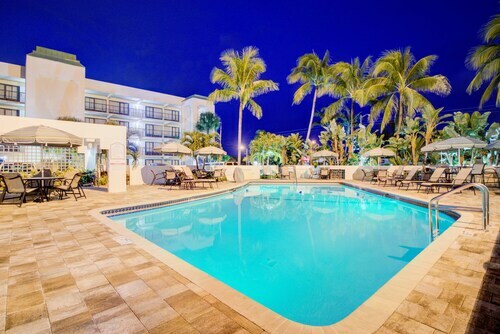 The Keys are within driving distance of most West Palm Beach hotels and make for a superb day out for all the family. Water sports enthusiasts can try their hand at wakeboarding and kayaking or go scuba-diving along the coral reefs. I thought having the gym &yoga center was an excellent idea. Although this time I was unable to use them. The restaurant and cafe with fresh and healthy choices was really good when having and easy especially if you have diet restrictions.